It all began in 1933, with a humble little push cart hawking its wares in the city’s central square. 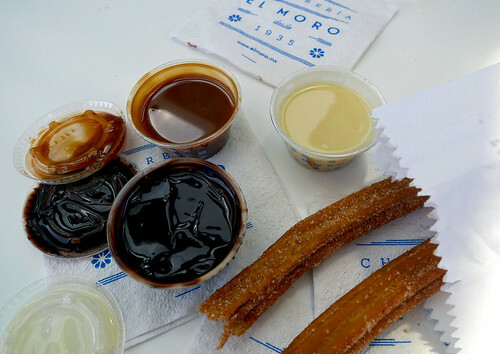 Today, Churrería El Moro is practically a household name, with almost a dozen brick and mortar locations scattered across the length and width of Ciudad de Mexico or CDMX. And while El Moro‘s empire has grown, it’s most basic offering remains unchanged. One that continues to fulfill the singular task of luring your taste buds into delightful submission. Its love at first bite. And every successive bite. The Churro is, and always will be, in the highest echelons of the desert kingdom. The Jacaranda, with its eye-catching purple foliage, is a tree native to central South America, but one that’s been planted widely across the world. In Mexico, a Jacaranda in bloom signals the advent of spring. 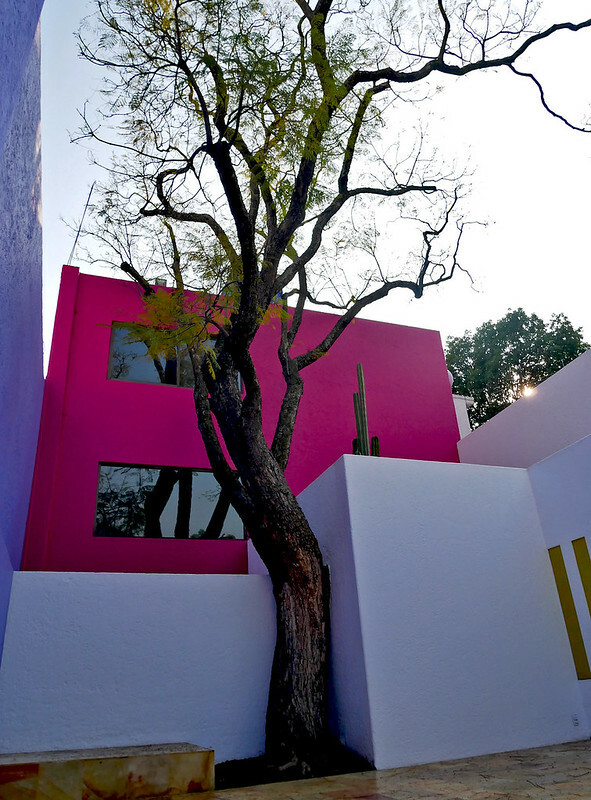 In the mid 70s, when architect Luis Barragán began crafting, what would be his last project, he centered his creation upon a little sapling. The Jacaranda grew, and around it, Casa Gilardi was born. To refer to his stunning work as a living museum would not be off the mark. As you wander about, gazing in amazement at the vibrantly colored walls, the many sight lines, and the play of light and shadows, you have to remind yourself time and again that the house is actually lived in. The son of the elderly couple that live there, conducts tours in Spanish and English (300 MXN), and is himself a treasure trove of information on everything Barragán related. 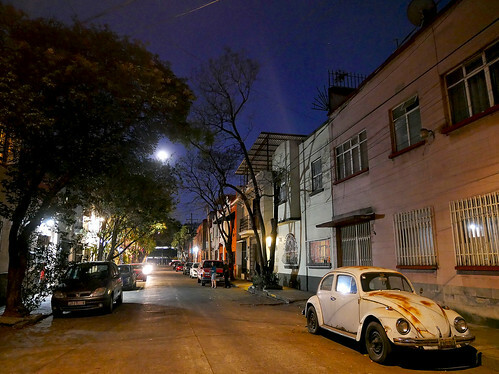 Its conveniently located too, in the leafy San Miguel Chapultepec neighborhood, an area worthy of its own exploration. If you can hack it, the city’s Metro is efficient, fast, and ridiculously cheap. If rush hour intimidates you – as it probably should here – then taxis are readily available too, as is everyone’s go to, Uber. Whatever means you choose, just try and get to Centro when Bósforo opens its doors for business – this often varies by day, despite the advertised schedule – and you’re guaranteed to get a seat. Any later, and you’ll be a statistic at the door. Such is the popularity of this Mezcaleria, one of the city’s first bars dedicated to all things Mezcal. 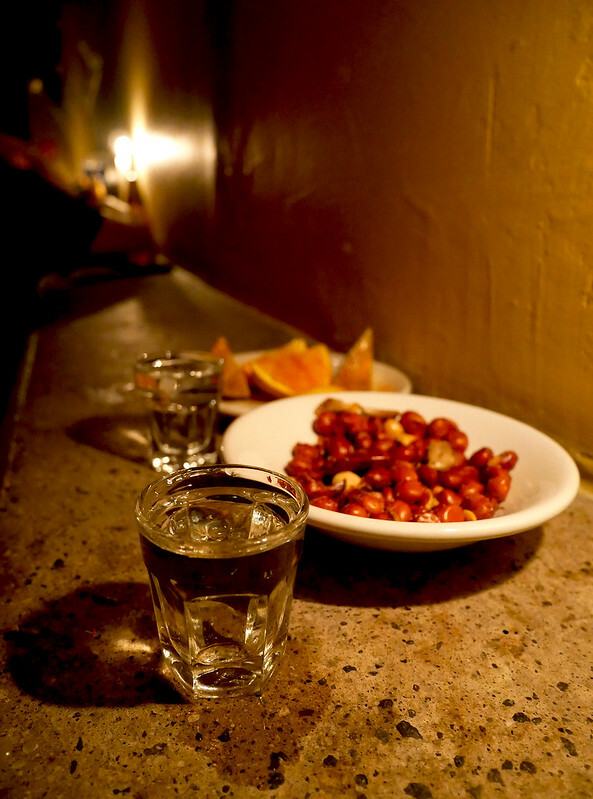 In a completely unpretentious setting, Bósforo offers small-batch Mezcals, purely for sipping, served with a side of Cachuetes, peanuts with their skin on, slightly oiled and seasoned with garlic, lime and chili, along with seasoned wedges of fruit. Mezcal, long regarded as the smokier cousin to Tequila, came into its own a few years ago, and while there’s no shortage of bars that will offer it up in a cocktail, the agave-based spirit gets its rightful due here. 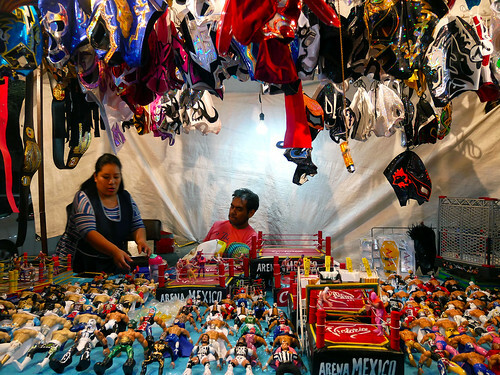 Considered to be the largest venue built specifically for wrestling, Arena México, often referred to as “the cathedral”, is one of three city venues that regularly hosts Lucha Libre, or freestyle wrestling. A sport, which for decades has been ripped off by the likes of WWE and other franchises. Except that here, the most prized seat in the arena will probably cost less than the average nose bleed in the States. So grab that Michelada, settle in to your seat, and watch the spectacle unfold; gallant luchadores waltzing in, dawning wild masks and outrageous costumes, accompanied by over the top music, flashing lights, and delirious crowds – the sheer ludicrousness of it all making this the best live entertainment your pesos could possibly buy. Don’t even bother with those photographs (anything other than a cellphone isn’t allowed into the venue) – the experience has to be lived to be believed. And it continues on the street outside, with shop after makeshift shop selling you everything from masks to luchador dolls to mini arenas; memories to last you till your next Lucha Libre encounter. The tradition of bakeries or panaderías is well over a century old in Mexico City, with practically every neighborhood, no matter how grand or gritty, sporting its own. So finding something appetizing for breakfast is hardly a struggle here, and even less so if you happen to be in Roma Norte. 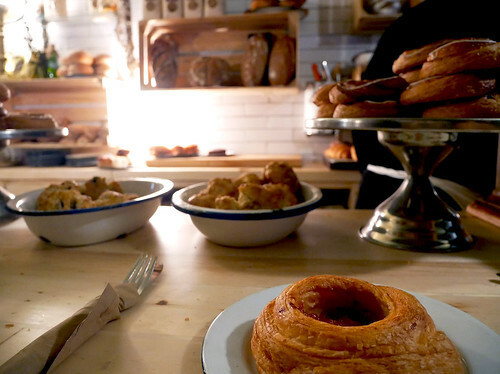 The spin-off from a well written up Italian restaurant nearby, and a relatively new entrant to the bakery scene, Rosetta has already won the affection of many. Granted its one of the hip ones around, attracting its share of Instagrammers, but you will be remiss not to try it. Start with one of those delectable Roles de Guayabas, a Danish stuffed with Guava and Ricotta. And maybe, end with that too. De Nada. Well south of, and practically a world away from the expat-friendly barrios of CDMX, lies the neighborhood of Coyoacán. Back in the early 16th-century, its where the conquistadors set up mission control, as they plotted to dethrone the Aztecs. 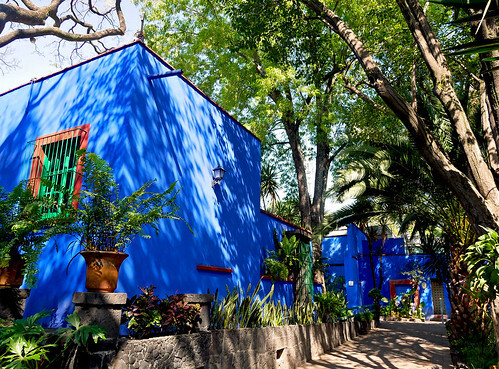 In its present day avatar, the largely residential barrio is home to several historic sites and museums, most notably Casa Azul, the birthplace and family home of legendary artist, Frida Kahlo. Walking through the narrow main entrance, you’ll emerge onto a sprawling courtyard, set amidst a sea of cobalt blue, under a canopy of beautiful trees. Its an incredibly serene setting, and you’ll want to linger there for a while. Within those blue walls – from which the house gets its name – you’ll pass through room after room, learning about Frida‘s life, her marriage to Diego Rivera, her work, and most of all, her innumerable struggles. A few hours later, you’ll walk away; richer for it, and completely humbled. Hold on to that ticket as you exit, and if you have time, head over to the Anahuacalli Museum, also in Coyoacán. Set up by Rivera, it houses his massive personal collection of pre-hispanic art, and your Casa Azul ticket gets you in for free. Further south, and only a short cab ride away, lies San Ángel, a neighborhood known for its cobblestone streets, stately homes, and no lack of colonial charm. 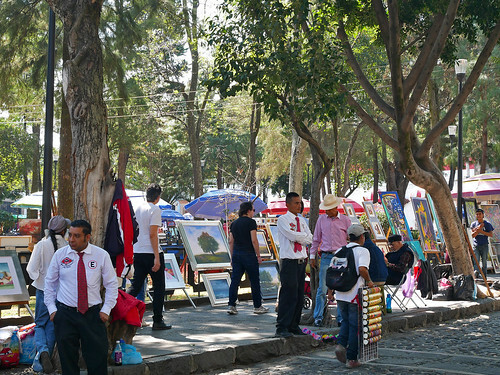 Every Saturday, San Ángel plays host to an art bazaar, known locally as Bazaar Sábado. Centered around verdant Plaza San Jacinto, and stretching as far as Plaza del Carmen, local artists display their colorful work, buskers weave their way through the crowds, hawkers hustle, and a full-blown flea market sells you everything from Día de los Muertos kitsch to Lucha Libre memorabilia. You’re not expected to walk away with a piece of art, or even a fridge magnet for that matter, but you will be rewarded for simply ambling around, for this is a sensory treat. And if hunger strikes, as it probably should by now, there are vendors sprinkled across the bazaar that could provide the fuel you need; fresh cut mango, coconut water, and shaved ice or Raspado, to name a few – perfect when you’re on the go, and guaranteed to keep you going. 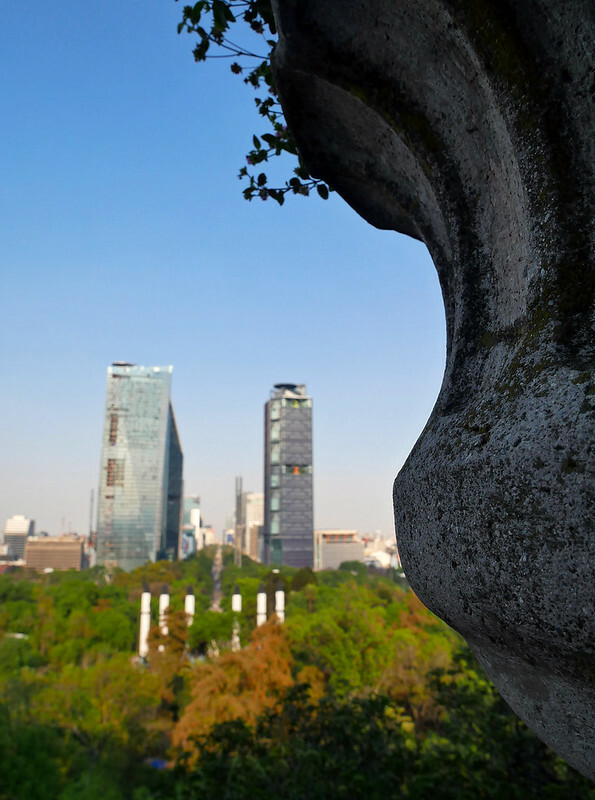 Bosque de Chapultepec or simply Chapultepec, is the large swath of green that roughly splits the barrios of Polanco and Condesa. Often referred to as the “lungs” of Mexico City, at ~1700 acres, it is one of the largest parks in the western hemisphere. As many as nine museums, a handful of lakes, multiple recreational areas, an archeological site, an ecological preserve, a zoo and a botanical garden make up its lush acreage – one could literally get lost within. Chapultepec has been of historic significance since Toltec times, much of it centered upon a rock formation, where they had an altar, and which they referred to as grasshopper hill. The Aztecs that followed considered it not just sacred, but strategic too. Then came the Spanish, who, in the late 18th-century, built a castle on the hill. After the Spaniards were thrown out in the early 20th-century, in came Napolean’s nephew, who for a short stint occupied Chapultepec Castle, till he met his bloody end. The castle’s current appearance is credited with his regime, and till the early 20th century, served as the official residence to successive Presidents of independent Mexico. Fittingly, its the country’s National Museum of History that occupies the coveted space today; its manicured lawns, opulent interiors, stunning floor to ceiling murals and exquisite stained glass windows, all open to the public, and an absolute joy to wander through. But more than anything, its the views at the very top of grasshopper hill that remain unparalleled. Al Pastor, probably the most revered amongst an endless array of Tacos this kind world – notably Mexico – has provided us with. It literally translates to, “in the style of the shepherd” and unknoweth to many, originated in Lebanon. Immigrants from that land, to be precise, who moved to Mexico in the early 20th-century, and traded spit-roasted lamb (think Shawarma) for pork, giving us the most beautiful of culinary gifts. A relatively new entrant to CDMXs ever expanding food scene, Orinoco serves Northern-style tacos from Monterrey. There’s only three meats on offer here; Trompo, Chicharrón, and Bistec. 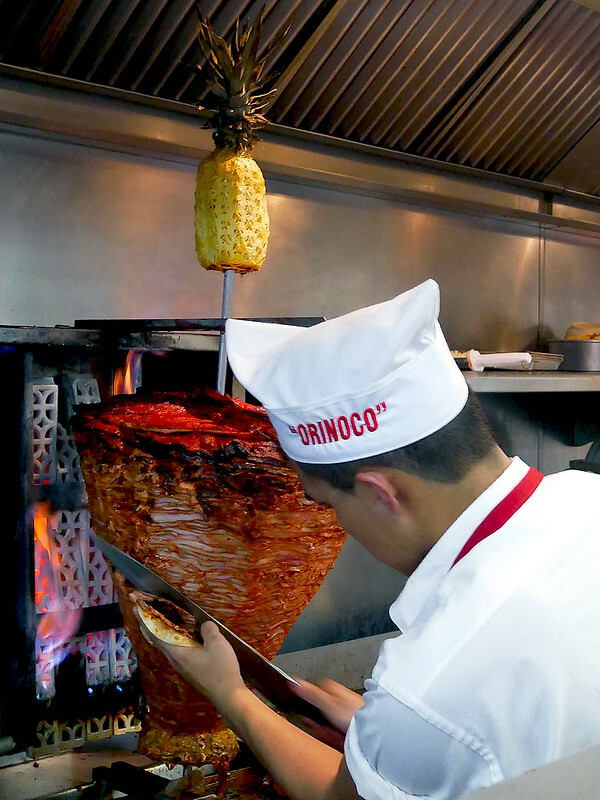 Trompo is the Spanish word for rotisserie, and the Al Pastor at Orinoco is simply called so. Now there’s absolutely no shortage of outstanding taquerias in this city, from humble carts to hole in the walls to more contemporary riffs, and I’ve certainly not been to enough of them, but the Al Pastor here, for now at least, is my favorite. Period. 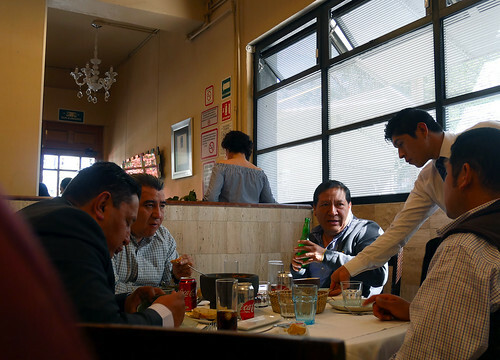 Mexico City’s most preferred meal, it turns out, is lunch. And its a drawn out affair too. A tradition, no better exemplified than at Nicos, a restaurant located in Colonia Clavería, a blue collar neighborhood in the north of the city. The restaurant itself has been around since the late 50s, but it was given a new lease of life just over a decade ago, by Gerardo, the son of the lady who started it. While the no frills venue has probably changed little, the menu fuses together the recipes and ingredients of ancient Mexico, and to some extent, those of Gerardo‘s mom, with more contemporary techniques and flavors. The results speak for themselves. This decades-old lunch institution is every bit worth the hype. Try the Cesar (it originated in Mexico, after all), be sure to get that perfectly cooked steak, Filete Nicolas; and budget some time towards the end of whats surely going to be a long meal, for your table side preparation of Cafe de Olla. Last but not the least, reserve well ahead of your trip, or you will be left disappointed. With a staggering one hundred and fifty museums to its credit, CDMX might well be one of the richest cities on this planet, culturally speaking. A good majority of them are free on Sunday’s, and most, if not all, are closed Mondays. Being the very beginning of the week, we’re out of luck, as we approach the magnificent Art Nouveau building that houses Palacio de Bellas Artes or the Palace of Fine Arts. Thankfully, I did venture in the last time I was here, and I couldn’t recommend it any more. So do yourself a favor and show up here any day except Monday. 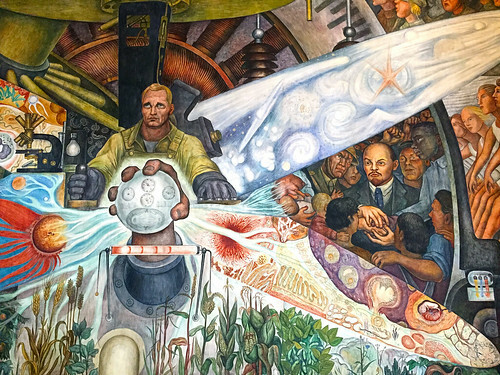 Then check out the rich collection of murals by Orozco, Rivera, Sigueiros, and other masters of the Mexican muralist movement; marveling at the museum’s spectacular Art Deco interiors, as you make your way up to its second floor. Built over what was once the Aztec city of Tenochtitlan, Plaza de la Constitucion or Zócalo, has served as the city’s main square for centuries. 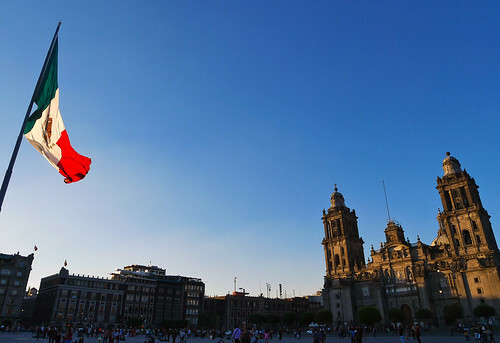 The historic heart of Mexico City – if not the geographic one anymore – Zócalo is humongous and majestic all at once; its where government, commerce and religion converge in the most dramatic of settings. Its a sight not to be missed. In 2013, I got here at sunrise – it was my first stop in the city, and probably the most impactful one too. Almost six years later, as the sun begins its westward trajectory, the spectacle is no less arresting. In between this visit and my last, Alfonso Cuarón gave us Roma, a film that had a tremendous impact on me, and only strengthened my resolve to return to Mexico City. From the endearing cry of the bicycle man hawking Tamales Oaxaqueños, to the piercing steam whistle of the pushcarts vending Camotes y Platanos, Cuarón brilliantly captured the very essence of Roma Sur, the working class neighborhood he grew up in. So out of sheer respect, I make my last stop, Calle Tepeji, the very setting for his masterpiece. A full set of photos from my trip to Mexico City, and a day trip to Puebla, can be viewed on my Flickr.